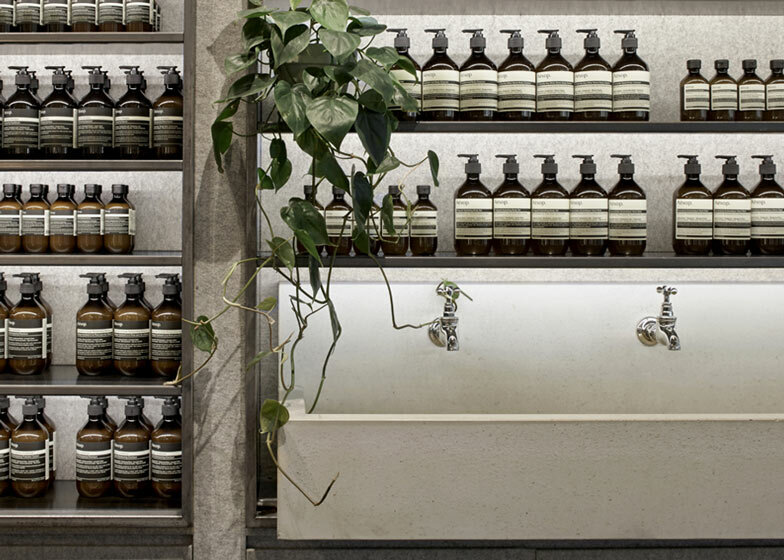 Grey wool felt covers the walls of this Aesop store in Shepherd's Bush, London, by French architects Tolila+Gilliland (+ slideshow). Parisian studio Tolila+Gilliland collaborated with lighting designers PSLAB on the renovation of a former jewellery shop for the latest Aesop store in London, which follows a Marylebone store filled with ladders and the smooth white plaster interior of the Covent Garden boutique. The store is located on the edge of the Westfield shopping centre, so architects Nicholas Gilliland and Gaston Tolila developed a design where the transition from mall to boutique would create "a separate interior world". "This former jewellery shop presented several challenges; the facade had a very narrow entry, the ceiling had low bulkhead in sections and a fire escape to the rear created a fragmented plan," Gilliland explained. "We worked to simplify the space, optimising the ceiling to define a cubic volume of roughly five metres, with a back-of-house for additional storage." "The surrounding environment is quite loud and reflective; we proposed to create a calm space in contrast to that," he said. Soft grey felt covers the interior walls. "The felt has this amazing tactile quality of course, but it was also important for the store's acoustic nature," Gilliland said. 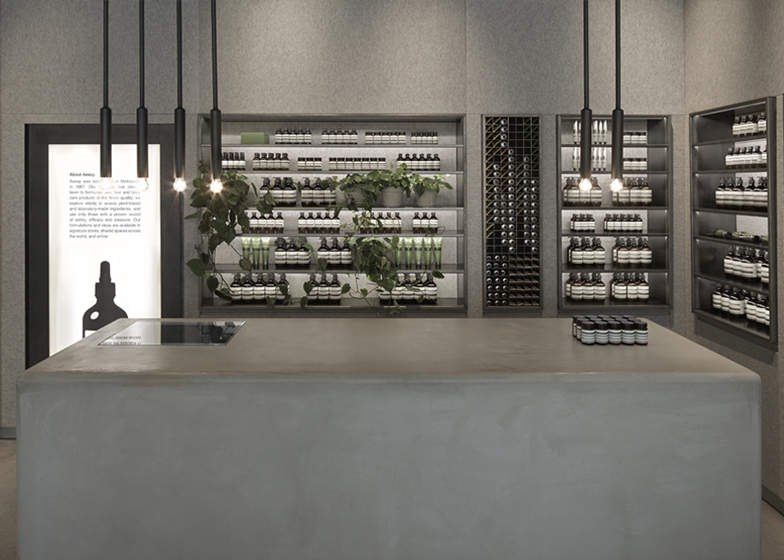 Products are displayed on black steel shelving set into cavities along each wall, interspersed with green vines that trail from various plant pots. A rounded concrete counter is positioned in the centre of the store, beneath a series of slim black pendant lights that hang low over it. A white sink with three silver taps occupies a space below a section of shelving, while a smooth concrete bench designed for customers to rest on is set against the glazed facade. The concrete bench continues on the exterior side of the glazed facade to create the illusion that there is no division between the interior and exterior of the store. 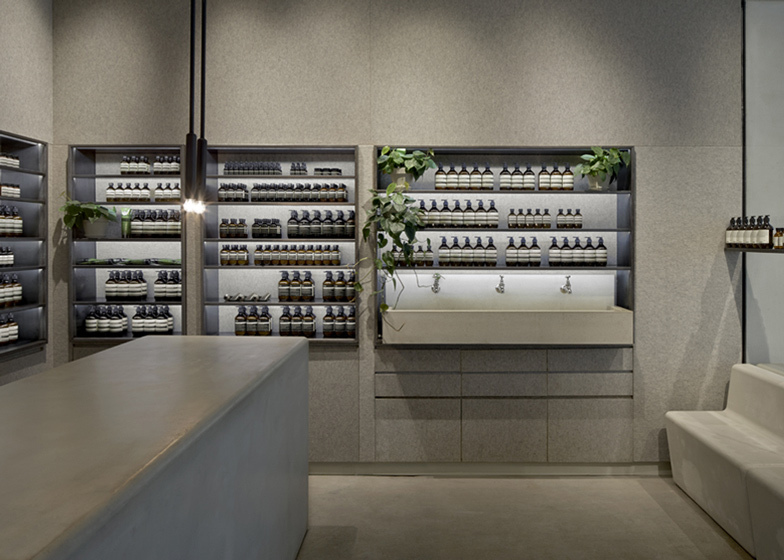 Pre-cast concrete panels clad the edges of the store's exterior, with three Aesop product dispensers integrated into the smooth, grey panels. 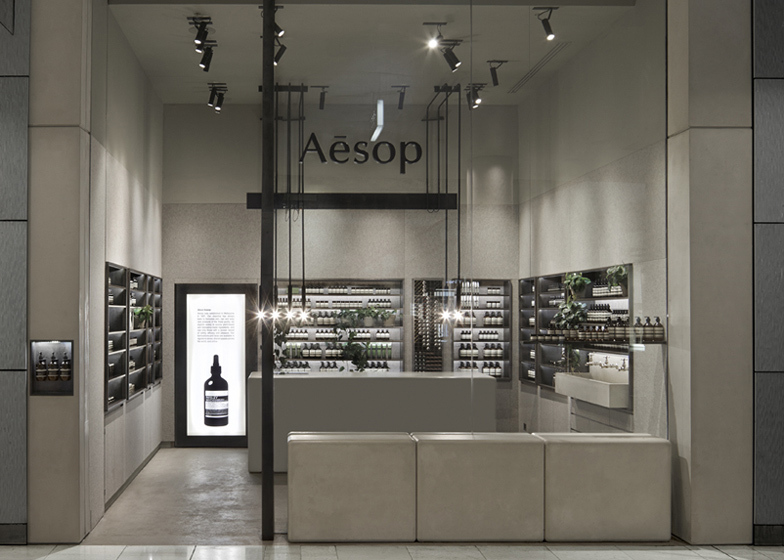 Aesop regularly works with different architects and designers and each store features a unique design. 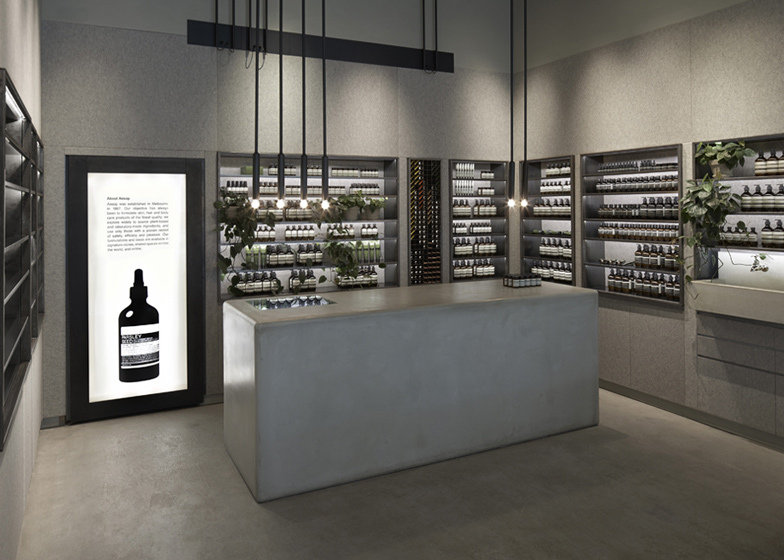 In an interview with Dezeen, founder of the skincare brand Dennis Paphitis said he was "horrified at the thought of Aesop evolving into a soulless chain".